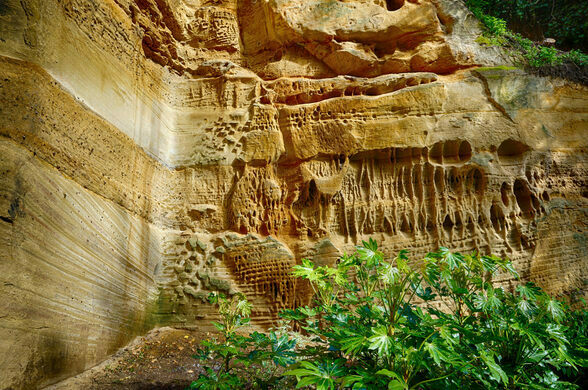 An unlikely entrance in an office parking lot leads to a cavernous hidden sandstone passage beneath the city. 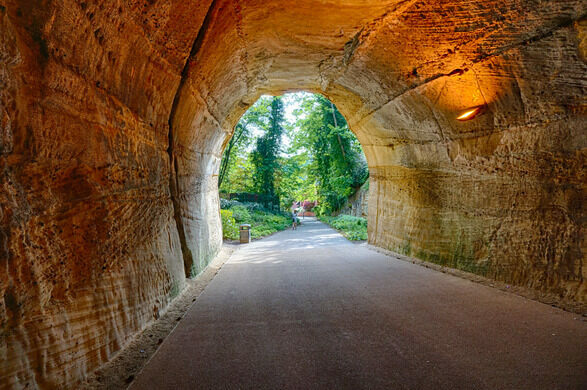 The tunnel was built in 1855 as the main access to an exclusive Victorian residential area, though thanks to a mistake, things did not end as planned. In the 19th century, the Duke of Portland, who owned nearby Nottingham Castle, wanted to convert some of his sizeable backyard into an exclusive residential development of palatial dwellings for Nottingham’s burgeoning middle class. To the west of the rapidly industrializing city and known as “The Park,” many impressive residences were constructed in the neighborhood by Nottingham’s competing architectural prodigies, Watson Fothergill and T.C. Hine. 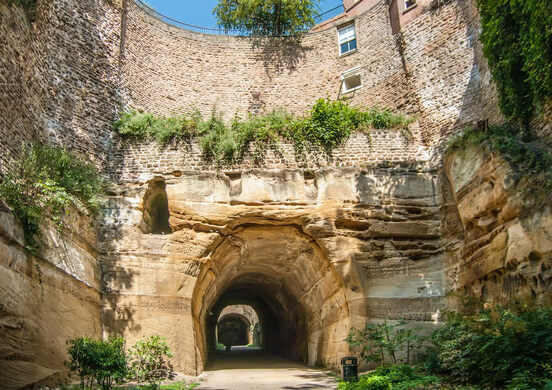 The Duke commissioned Hine to excavate a tunnel through the city’s soft and crumbly sandstone substrate, creating a grand and impressive approach to the wealthy new neighborhood from Derby Road, a main city thoroughfare. He specified a maximum incline of 1 in 14 along the tunnel’s length to allow the heavy horse-drawn carriages of the day to pass. Unfortunately, after the project’s completion the incline was found to be 1 in 12, making it too steep for even the strongest horses to haul a carriage, so the tunnel was abandoned. 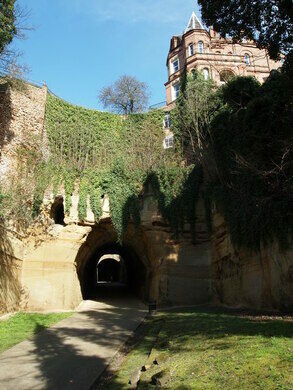 An alternative road entrance was created for The Park, leaving the tunnel to languish forever as a little-used but incredibly grand subterranean footpath accessed by steep Victorian staircases, its crumbly sides held up by high brickwork. Today, after many decades of urban development, this ultimately doomed, yet startlingly grand, infrastructure terminates in the most unlikely manner at a parking lot shared by a convent and office buildings. 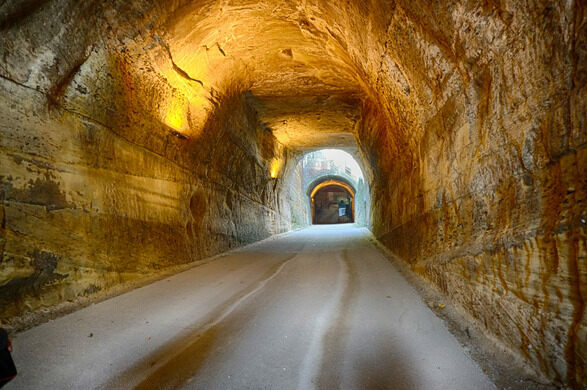 The tunnel is open to pedestrians. 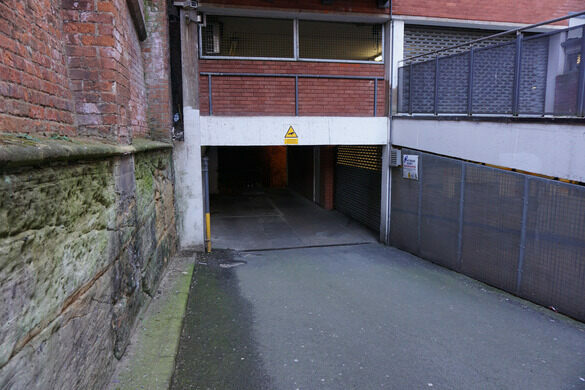 The Derby Road end of the 350-foot-long passage is accessed via double gates marked "Parkgate and the Convent." The entrance within the private Park Estate is off Tunnel Road. The coordinates given are for the mid-way point of the tunnel, accessed from a street called The Ropewalk. 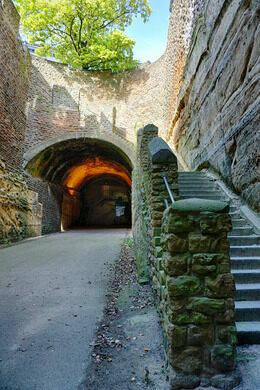 Here, the tunnel is accessible via steep Victorian-era steps.